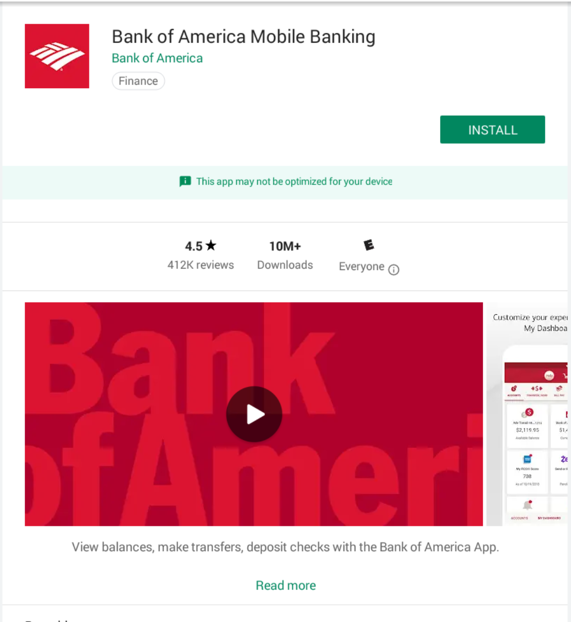 To add Trojan code to the Bank of America Android app and steal confidential information, putting it into the log, as a proof of concept. 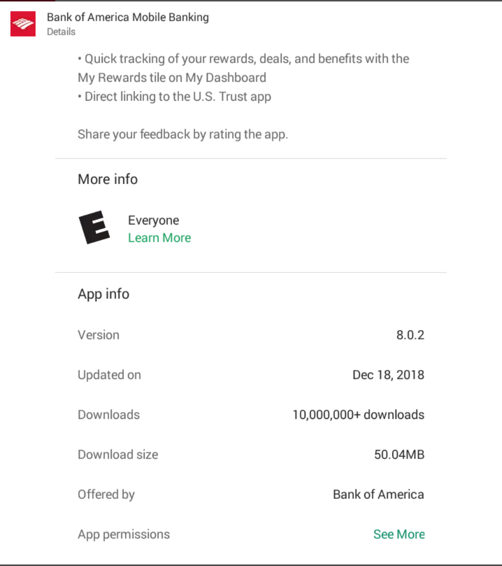 I notified Bank of America about this in 2015 but they did not fix it. If they update the app, and you want the instructions below to work exactly as written, use this archived copy. The file downloads into Kali, as shown below. The file unpacks, as shown below. The module we want to modify appears, highlighted in the image below. Enter the search string setAtmPin as shown below. The routine that gathers the user's ATM card PIN appears, as shown below. Adjust the code as shown below, to log the PIN. All the modified or added lines are outlined in green. Type Ctrl+X, Y, Enter to save the file. 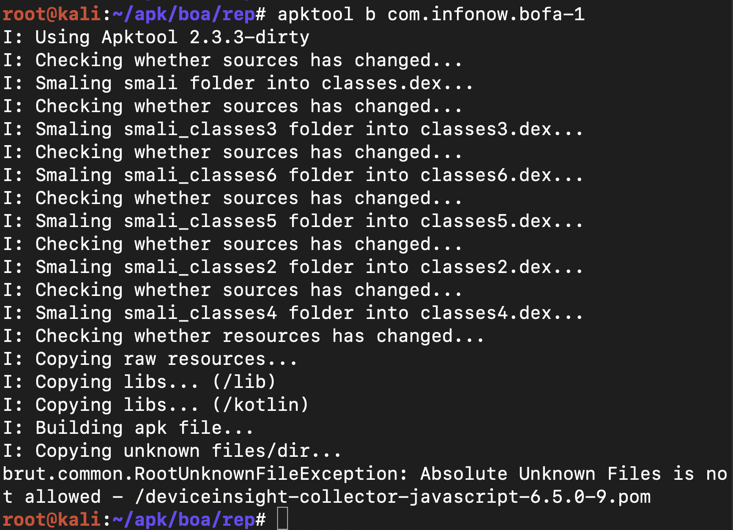 Execute this command to repackage the APK file. There was a "brut.common" error at the end, as shown below, but it seems OK to just ignore it. 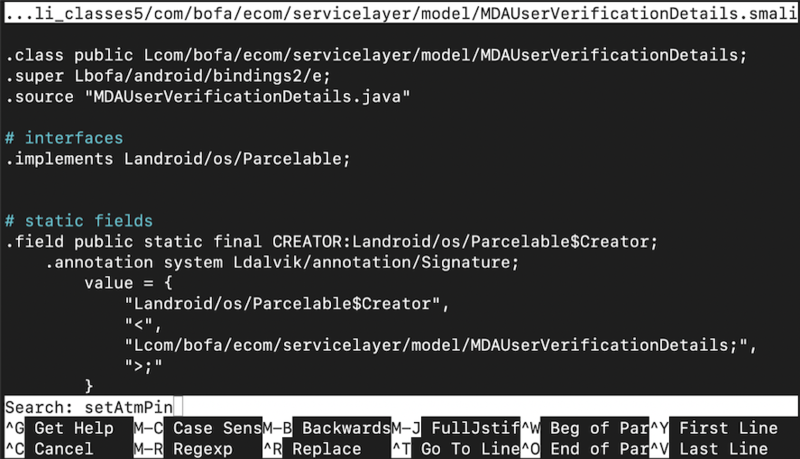 I think this error comes from a Java version conflict. The simplest fix I found is to just extract a fresh Kali 2019.1 64-bit VM and use it instead of a machine that has been used for other projects. If you get a "E: Could not get lock /var/lib/dpkg/lock-frontend" error, restart Kali. On your Bluestacks virtual Android device, open Settings and tap these items. The process succeeds, as shown below. The terminal pauses, waiting for matching log entries, as shown below. At the lower center, click the circular icon with six dots. Click BofA. The phone turns sideways and the print becomes tiny. 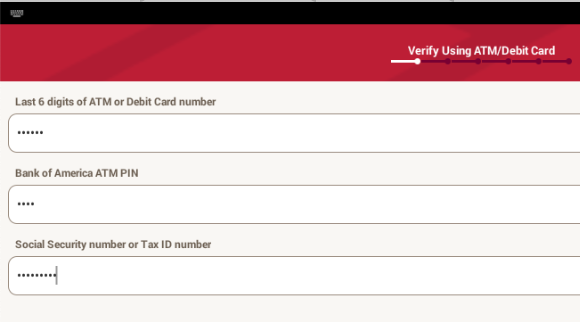 At the bottom, click "Sign in or enroll"
At the bottom, click "GET STARTED"
At the top, click "ATM or Debit Card"
The PIN appears in the log, as shown below. Make sure you can see the stolen PIN, as shown above. Save the image with the filename "YOUR NAME Proj 5xa", replacing "YOUR NAME" with your real name. Add Trojan code to the app that steals the SSN during account registration, as shown below. Capture an image of the log including a SSN, as shown above.